SCRANTON – The Legion of Mary recently inducted new members into its Our Lady of Confidence Praesidium at Holy Family Residence, 2500 Adams Ave. The members of this group meet weekly at the residence to perform spiritual works of mercy and to pray with and visit the residents. Founded on September 7, 1921 in Dublin, Ireland, the Legion of Mary serves the Church and their neighbors on a voluntary basis in about 170 countries. For more information on joining the Legion of Mary, please call Sister M. Rosella Salvato, I.H.M., spiritual director, at 570-346-3359. Photo Caption: The Legion of Mary recently inducted new members into its Our Lady of Confidence Praesidium at Holy Family Residence, Scranton. 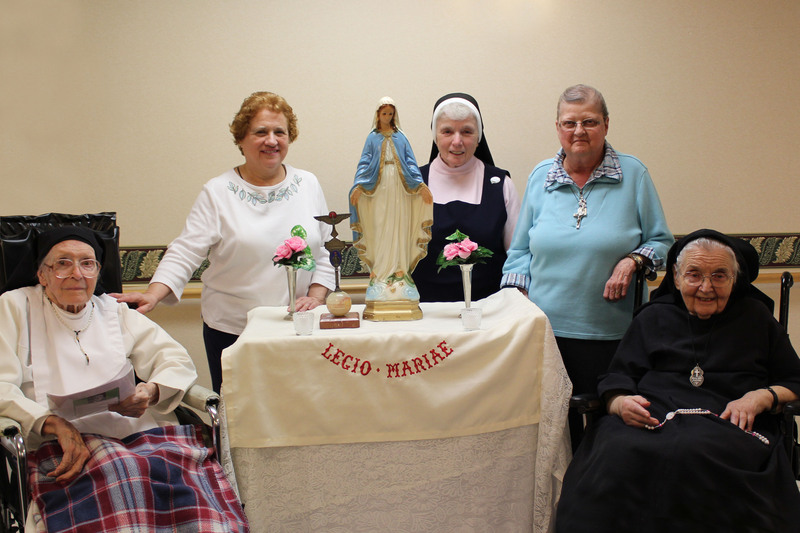 Pictured from left to right are Sister Jeanne Marie Pearse; Josie Roman, president; Sister M. Rosella Salvato, I.H.M., spiritual director; Jeanne Lombardo; and Sister Regina Vane.